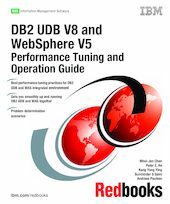 This IBM Redbooks publication discusses the integrated environment of DB2 UDB and WebSphere Application Server (WAS), including design considerations, best practices, operation, monitoring, and performance tuning. We provide an overview of the architecture and main components of both WebSphere Application Server V5.0.2 and DB2 UDB V8. We introduce their key application and system performance tuning parameters. We discuss the general steps to get DB2 UDB V8 and WAS V5 working together. We also discuss the available JDBC drivers shipped with DB2 UDB V8 and their differences. The steps to set up DB2 for z/OS as the data source using DB2 Connect is also included. We describe the performance tuning tools, methodology, guidelines, and the application performance best practices for DB2 UDB, WAS, and the DB2 UDB/WAS integrated environment. Finally, we present some common methods of diagnosing the problems related to DB2 UDB and/or WebSphere Application Server. We provide some problem scenarios where you will learn the problem determination methodology and mechanisms to resolve such problems.